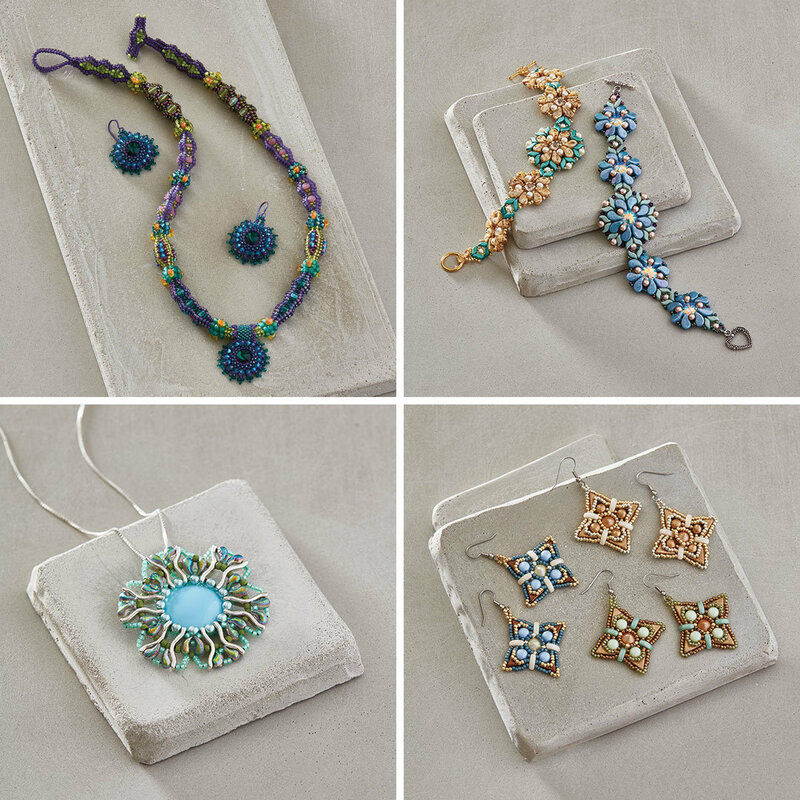 The April/May 2019 issue of Beadwork magazine is chock full of beautiful projects, and many of them feature right-angle weave (RAW). I’ve selected some stand-out patterns that use shaped beads and showcase right-angle weave’s versatile nature. Let’s break down RAW step-by-step and take a look at these lovely designs! For one-needle right-angle weave, string 4 beads and pass through the first 3 beads again to form the first unit. For the rest of the row, string 3 beads and pass through the last bead exited in the previous unit and the first 2 beads just strung. 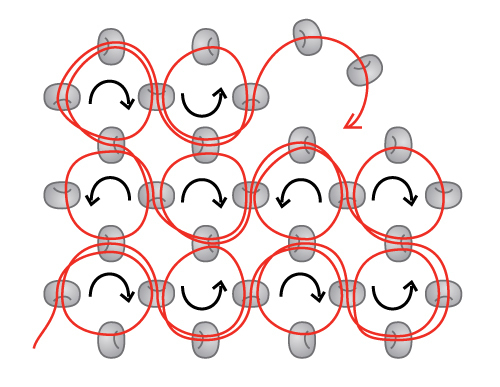 The thread path will resemble a series of figure eights, alternating direction with each unit. To begin the next row, pass through beads to exit from the top bead of the last unit. String 3 beads and pass through the last bead exited and the first bead just strung. *String 2 beads; pass back through the next top bead of the previous row, the last bead exited in the previous unit, and the 2 beads just strung. Pass through the next top bead of the previous row. String 2 beads; pass through the last bead of the previous unit, the top bead just exited, and the first bead just strung. Repeat from * to complete the row, then begin a new row as before. 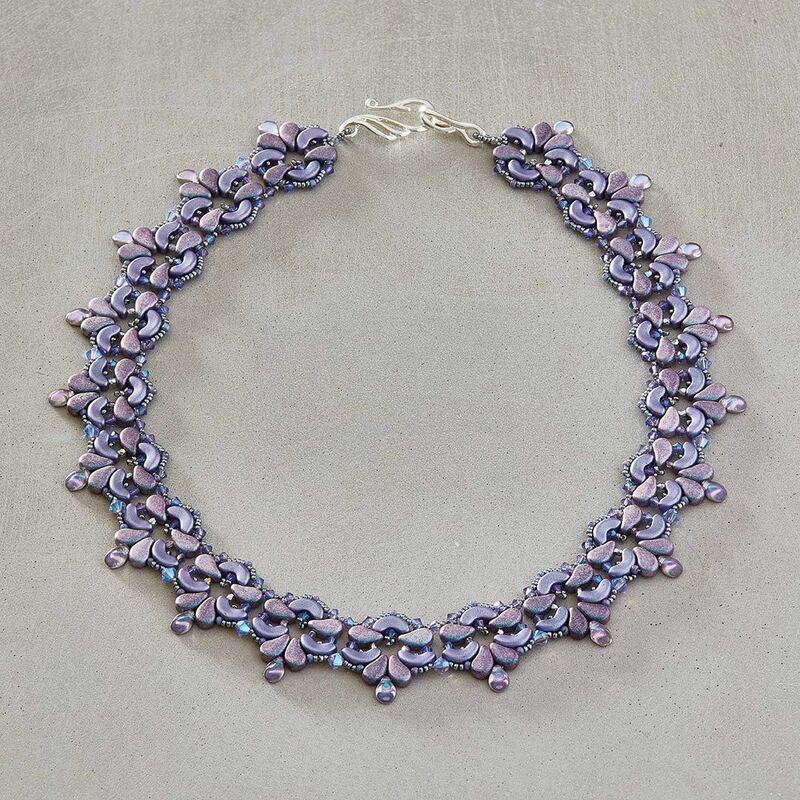 Stitch this gorgeous collar by Laura Graham one unit at a time using multi-hole shaped beads and a RAW variation. The PaisleyDuos and Arcos Par Puca beads in this gorgeous collar make it slinky and smooth to the touch. 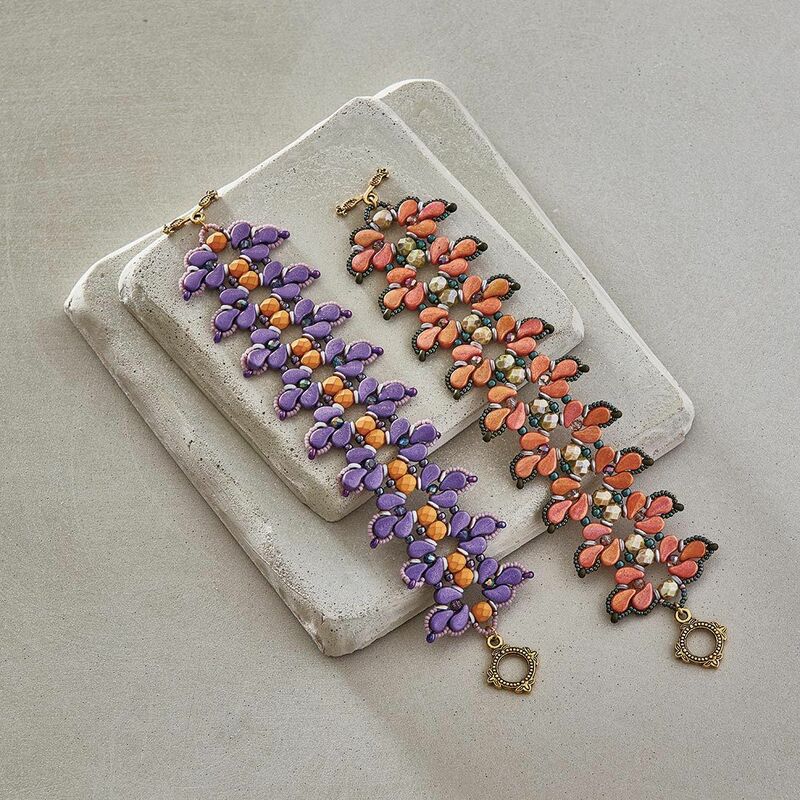 Inspired by the beauty of iris flowers, Debora Hodoyer designed this bracelet using two-hole PaisleyDuo beads to create an intriguing petal shape. Flip-flopping the direction of the inside to the outside petals creates height and interest to the bracelet. 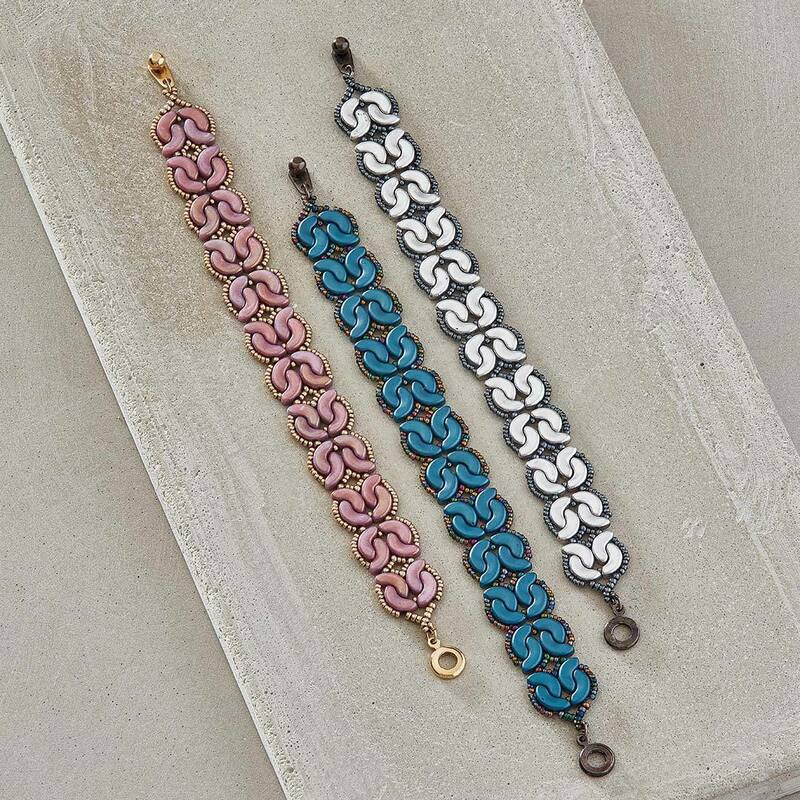 Combine a variation of right-angle weave with Demi rounds, MiniDuos, RounDuos, and crystal rondelles to make this opulent bracelet by Debora Hodoyer. With the right combination of beads, this bracelet shows that right-angle weave can make complex and interesting shapes, not just squares and circles. Kim West designed this unique right-angle weave bracelet using Arcos par Puca beads and seed beads. The shape of the units formed by interlocking the Arcos beads reminds us of the base of a cello instrument. The unit-by-unit nature of the stitch gives this bracelet an eye-pleasing repetition that feels musical as well. Right-angle weave isn’t always the frontrunner in a design, but provides an important supporting role in four more patterns from the April/May issue of Beadwork. In Wendy Ellsworth’s Hawaiian Dream Song Necklace, you use RAW to form the bezel around the centerpiece rivoli. This is my new favorite way to bezel a rivoli fast. Susan Sassoon’s Paisley Storm Bracelet features a RAW variation to connect the components to one another. In Anna Bawden’s Solange Pendant, right-angle weave forms the bail on the back. The centers of Evelína Palmontová’s Compass Rose Earrings are created with a RAW thread path. Right-angle weave is a stitch that plays well with others, is not too difficult to master, and has withstood the test of time! Grab your copy of the April/May 2019 issue of Beadwork and your beat mat (affiliate link) and get stitching with right-angle weave!